Signs On The World's Flush Toilets Teach Toilet Etiquette To Those Used To Pit Latrines : Goats and Soda Billions of people around the world don't use flush toilets. That's why there are so many signs that explain what to do — and what not to do. 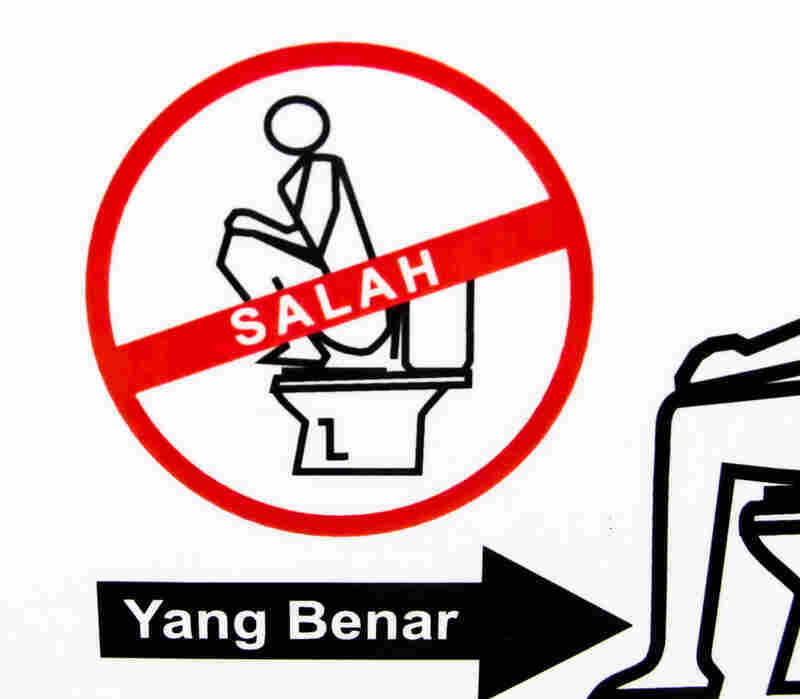 A sign in Indonesian shows how not to sit on a toilet. You'd think that everyone on the planet would know how to use a flush toilet: Flip open the cover, assume the position and go. But for many people, the flush toilet is a UFO — an unfamiliar flowing object. Nearly 2 billion people in the world use pit latrines, one of the most common kinds of disposal systems for human waste in low-income countries. Squat toilets are still popular in East Asia and the Middle East. And almost 2.4 billion people have no access to toilets or latrines at all — that's one out of three earth citizens. Adam Drolet, project manager for PATH's WASH initiative, says these folks might go in open fields, on other people's property or even in a plastic bag, which is tossed outside and known as a "flying toilet." So a newcomer to the flush toilet might be confused. Drolet learned that fact when he was working on a latrine project for the Peace Corps in Paraguay in 2008. "We started noticing footprints and shoeprints on the toilet seats," he says. "Turns out people felt much more comfortable in the squat position and wanted to continue squatting when 'going,' even if this meant perching and balancing on the skinny, rounded ceramic seat." For the benefit of the uninitiated, bathrooms around the world have diagrams and signs to teach what you've gotta know when you've gotta go. And since today is World Toilet Day, we thought it'd be a good occasion to share the knowledge. Thailand: Stand on the floor, not the toilet bowl. Poland: Don't forget to pull your pants down. Australia: Don't hover over the toilet. China: Try to have a little aim. Malaysia: Don't flush the toilet with your feet. United Arab Emirates: Keep the bathroom clean... and don't do these three things.